Please tell me Trubel is the lead! After being off the air for a little over a year, it was announced this week that a spinoff is currently in development for NBC’s Grimm! Still associated with NBC, the currently untitled spinoff comes from writer/executive producer Melissa Glenn (Zoo and Beauty and the Beast). Original executive producers of the spinoff’s predecessor, Sean Hayes and Todd Milliner are set to return, with Grimm co-creators David Greenwalt and Jim Kouf serving as consulting producers. 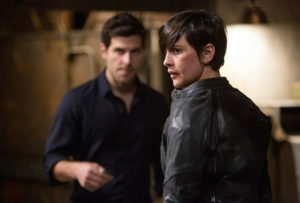 Ever since the Grimm ended in March 2017, there have been rumors of a spinoff occurring (of the Trubel variety), but this writer thought they were just that – rumors. But with this spinoff in development, and it being a fantasy show with multiple generations, the ideas on who could be the woman leading the show and what it could be about, are rather endless. Will it be set years in the future, with Diana taking the lead, the next generation of grimms? Or is it time for more Trubel (Jacqueline Toboni)? With that said, it seems that regardless, former Grimm cast members are slated to make an appearance. And I couldn’t be happier. Thoughts, Grimmsters? With this information alone, will you be tuning in to the spinoff? Or are you waiting to see if your favorite character makes an appearance?